← Where did the tube go? 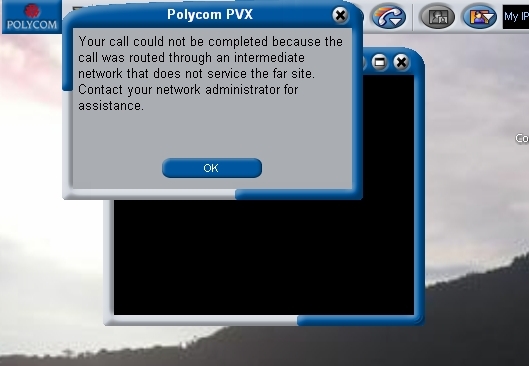 Your call could not be completed because the call was routed through an intermediate network that does not service the far site. Contact your network administrator for assistance. Most likely Cause: Firewall or Router access list blocking the H.323 messages required. If there is a gatekeeper involved the unit may not be registered properly. To alleviate the problem of IP dialing, the H.323 standard defines the use of a gatekeeper. This entry was posted in polycom. Bookmark the permalink. Another reason for this error is that you are not actually calling a vidconf node. A common example of this problem is a site where the vidconf unit is on DHCP rather than a static IP and it loses the lease to the IP – you end up calling a desktop and get the “Your call could not be completed because ..” message.